Jet Dock's L-Shape Floating Walkway is an easy way for you to dock your boat and walk up to it while it's docked. 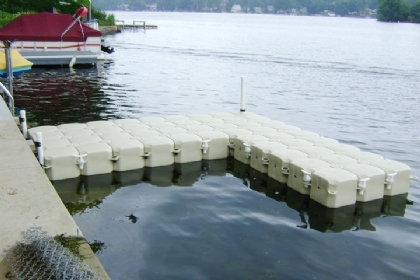 The L-Shape Floating Boat Dock Walkway is 5' wide by 20' long plus 5' wide by 15' long. The L-shape floating dock boat walkway design is completely versatile and allows you safely board your watercraft or enjoy a day on the water with plenty of room so spare. Modular, changeable design that allows floating walkways of any size and style to be created. Read below about the features and benefits of our walkway system. 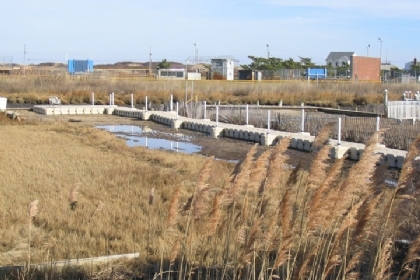 Perimeter tie-off cleats included for this dock. Make docking your boat easier, and have a versatile walkway system. 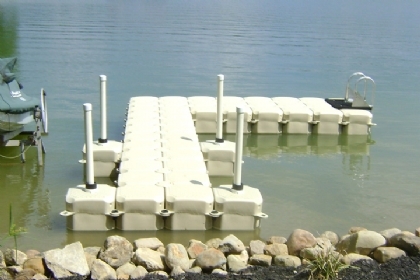 Learn more about ordering L-Shape Floating Walkways by calling 1-800-538-3625 or contact us today.